Edit: Gif just loaded, nope. Is this going to be like the supposed solution to the last puzzle in PT and I'll be up all night with no payoff? Santa Monica making a ballet game confirmed? Starcraft Ghost exclusive to PS4! Santa Monica studio community manager is posting. Santa Monica did God of War series. Gif shows someone taking a step. Caption says to take a step for the fragment. Assassin's Creed features both steps and fragments. Kratos vs Desmond crossover confirmed. Edit: my sources tell me it's not Desmond. You play as Achilles, an assassin known for defeating the templar Hector of Troy. Featuring a hack and slash open world stealth game. Well that seems distinctly not God of War-ey? Maybe a new SSM partner project like with Unfinished Swan? Not sure if Cranky Kong or Half-Life 3. I'm comfortable where I am, thank you. Kratos is now a ballerina? Sony Santa Monica developing sequel to Sword Art Online: Hollow Fragment. the dance game everyone has been waiting for! Why are you guys mentioning SSM? Is this clip from them? EDIT - never mind; title change has cleared it up. Weird title change. OP is from Sony Santa Monica. Makes it sound like he's reporting on a news article. I hate to ask but is this not self promotion? Also its a nice tease for later this week probably PSX. 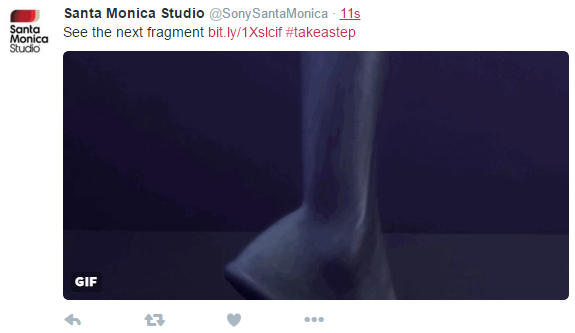 Well, the guy who posted this thread is Sony Santa Monica's community manager. Sure, but I want the title to reflect the content of the thread. well that is interesting . Looking forward to Goddess of Dance. Looks like a ninjas foot. God of War in Ancient Japan? It implies stealth to me, and people think it may be a woman. It's obviously Raiden then. Wig of War is real. Scratch that, only saw the first part.